Why should you be hired for this job? Point out how your talents and how they meet what the organization needs. Do not mention any other job candidates and try to make a comparison. Try to tie a few things to your career path and how it is a good fit. Answer this question with confidence. Do not waffle. You show already know why you should be hired. 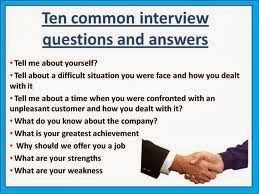 If you have doubts or are tentative about this answer, your interviewer might also have doubts. Why did you leave (or want to leave) your last job? Stay positive regardless of the circumstances. Never refer to a major problem with management and never speak ill of supervisors, co-workers or the organization. If you do, you will be the one looking bad. Keep smiling and talk about leaving for a positive reason such as an opportunity, a chance to do something special or other forward-looking reasons. What do you know about this company/organization? This question is one reason to do some research on the organization before the interview. Find out where they have been and where they are going. What are the current issues and who are the major players? What have you done to improve your knowledge in the last year? Try to include improvement activities that relate to the job. A wide variety of activities can be mentioned as positive self-improvement. Have some good ones handy to mention. Do you have any weaknesses? Trick question. If you know about weakness, they are no longer blind spots. Do not reveal any personal areas of concern here. Let them do their own discovery on your bad points. Do not hand it to them. Numerous answers are good, just stay positive. A few good examples: Your ability to prioritize, Your problem-solving skills, Your ability to work under pressure, Your ability to focus on projects, Your professional expertise, Your leadership skills, Your positive attitude. What have you learned from mistakes on the job? Here you have to come up with something or you strain credibility. Make it small, well intentioned mistake with a positive lesson learned. An example would be working too far ahead of colleagues on a project and thus throwing coordination off. Have you ever had to fire anyone? How did you feel about that? This is serious. Do not make light of it or in any way seem like you like to fire people. At the same time, you will do it when it is the right thing to do. When it comes to the organization versus the individual who has created a harmful situation, you will protect the organization. Remember firing is not the same as layoff or reduction in force. Try to avoid labels. Some of the more common labels, like progressive, salesman or consensus, can have several meanings or descriptions depending on which management expert you listen to. The situational style is safe, because it says you will manage according to the situation, instead of one size fits all. You should be clear on this with your family prior to the interview if you think there is a chance it may come up. Do not say yes just to get the job if the real answer is no. This can create a lot of problems later on in your career. Be honest at this point and save yourself future grief. Are you willing to work overtime? Nights? Weekends? This is up to you. Be totally honest. What would your previous manager say your strongest point is? Loyalty, Energy, Positive attitude, Leadership, Team player, Expertise, Initiative, Patience, Hard work, Creativity, Problem solver. What kind of salary are you asking for? A common loaded question. A tricky little game that you will probably lose if you answer first. So, do not answer it. Instead, say something like, That’s a tough question. Can you tell me the range for this position? In most cases, the interviewer, taken off guard, will tell you. If not, say that it can depend on the details of the job. Then give a wide range. Stay away from a specific job. You cannot win. If you say the job you are contending for is it, you strain credibility. If you say another job is it, you plant the suspicion that you will be dissatisfied with this position if hired. The best is to stay genetic and say something like: A job where I love the work, like the people, can contribute and can’t wait to get to work. Do you think you are overqualified for this position? Regardless of your qualifications, state that you are very well qualified for the position. How do you propose to compensate for your lack of experience? First, if you have experience that the interviewer does not know about, bring that up: Then, point out (if true) that you are a hard working quick learner. What qualities do you look for in a Manager? Tell me about a time when you helped resolve a dispute between coworkers. Pick a specific incident. Concentrate on your problem solving technique and not the dispute you settled. Emphasize benefits to the company and the hiring manager. Things like, determination to get the job done and work hard but enjoy your work are good.